If you want to know what US forces are doing in Africa, it helps to be connected to a large engineering or construction firm looking for business. What the military will say to a reporter and what is said behind closed doors are two very different things—especially when it comes to the US military in Africa. 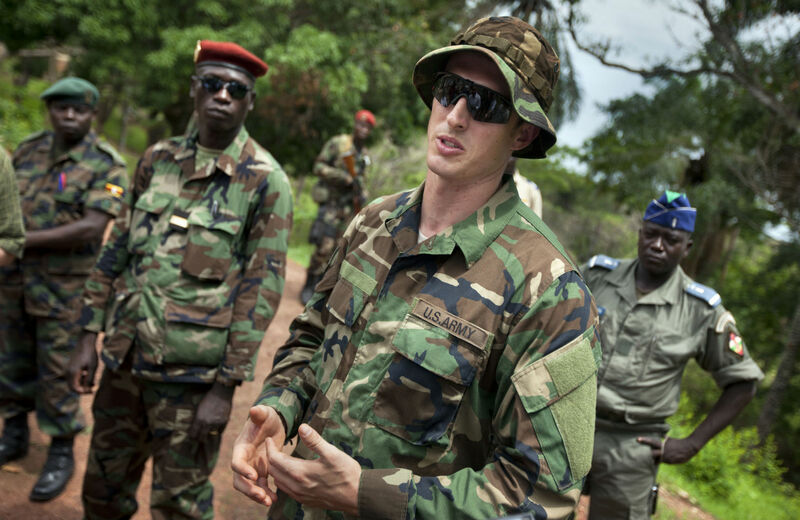 For years, US Africa Command (AFRICOM) has maintained a veil of secrecy about much of the command’s activities and mission locations, consistently downplaying the size, scale and scope of its efforts. At a recent Pentagon press conference, AFRICOM Commander General David Rodriguez adhered to the typical mantra, assuring the assembled reporters that the United States “has little forward presence” on that continent. Just days earlier, however, the men building the Pentagon’s presence there were telling a very different story—but they weren’t speaking with the media. They were speaking to representatives of some of the biggest military engineering firms on the planet. They were planning for the future and the talk was of war. I recently experienced this phenomenon myself during a media roundtable with Lieutenant General Thomas Bostick, commander of the US Army Corps of Engineers. When I asked the general to tell me just what his people were building for US forces in Africa, he paused and said in a low voice to the man next to him, “Can you help me out with that?” Lloyd Caldwell, the Corps’s director of military programs, whispered back, “Some of that would be close hold”—in other words, information too sensitive to reveal. The only thing Bostick seemed eager to tell me about were vague plans to someday test a prototype “structural insulated panel-hut,” a new energy-efficient type of barracks being developed by cadets at the US Military Academy at West Point. He also assured me that his people would get back to me with answers. What I got instead was an “interview” with a spokesman for the Corps who offered little of substance when it came to construction on the African continent. Not much information was available, he said, the projects were tiny, only small amounts of money had been spent so far this year, much of it funneled into humanitarian projects. In short, it seemed as if Africa was a construction backwater, a sleepy place, a vast landmass on which little of interest was happening. Cook offered no information on the possible location of that facility, but recent contracting documents examined by TomDispatch indicate that the US Air Force is seeking to purchase large quantities of jet fuel to be delivered to Niger's Mano Dayak International Airport. Here, however, is the reality as we know it today. Over the last several years, the US has been building a constellation of drone bases across Africa, flying intelligence, surveillance, and reconnaissance missions out of not only Niger, but also Djibouti, Ethiopia, and the island nation of the Seychelles. Meanwhile, an airbase in Ouagadougou, the capital of Burkina Faso, serves as the home of a Joint Special Operations Air Detachment, as well as of the Trans-Sahara Short Take-Off and Landing Airlift Support initiative. According to military documents, that “initiative” supports “high-risk activities” carried out by elite forces from Joint Special Operations Task Force-Trans Sahara. US Army Africa documents obtained by TomDispatch also mentionthe deployment to Chad of an ISR liaison team. And according to Sam Cooks, a liaison officer with the Defense Logistics Agency, the US military has twenty-nine agreements to use international airports in Africa as refueling centers. US Facility near Gao, Mali. This austere compound is thought to have been overrun by Islamist forces in 2012. Credit: US Army Corps of Engineers. As part of the webinar for industry representatives, Wayne Uhl, chief of the International Engineering Center for the Europe District of the Army Corps of Engineers, shed light on shadowy US operations in Mali before (and possibly after) the elected government there was overthrown in a 2012 coup led by a US-trained officer. Documents prepared by Uhl reveal that an American compound was constructed near Gao, a major city in the north of Mali. Gao is the site of multiple Malian military bases and a “strategic” airport captured by Islamist militants in 2012 and retaken by French and Malian troops early last year. America’s lone official base on the African continent, Camp Lemonnier, a former French Foreign Legion post in Djibouti, has been on a decade-plus growth spurt and serves a key role for the US mission. “Camp Lemonnier is the only permanent footprint that we have on the continent and until such time as AFRICOM may establish a headquarters location in Africa, Camp Lemonnier will be the center of their activities here,” Greg Wilderman, the Military Construction Program Manager for Naval Facilities Engineering Command, explained. According to documents provided by Wilderman, five contracts worth more than $322 million (to be paid via MILCON funds) were awarded for Camp Lemonnier in late 2013. These included deals for a $25.5 million fitness center and a $41 million Joint Headquarters Facility in addition to the Special Operations Compound. This year, Wilderman noted, there are two contracts—valued at $35 million—already slated to be awarded, and Captain Rick Cook specifically mentioned deals for an armory and new barracks in 2014. Cook’s presentation also indicated that a number of long-running construction projects at Camp Lemonnier were set to be completed this year, including roads, a “fuel farm,” an aircraft logistics apron and “taxiway enhancements,” while construction of a new aircraft maintenance hangar, a telecommunications facility and a “combat aircraft loading area” are slated to be finished in 2015. “There’s a tremendous amount of work going on,” Cook said, noting that there were twenty-two current projects underway there, more than at any other Navy base anywhere in the world. The Naval Facilities Engineering Command’s Wildeman talked up the challenges of working in an environment in which the availability of resources was limited, the dangers of terrorism were real, and there was “competition for cooperation with [African] countries from some other world powers.” This was no doubt a reference to increasing Chinese trade, aid, investment and economic ties across the continent. For years, senior AFRICOM officers and spokesmen have downplayed the scope of US operations on the continent, stressing that the command has only a single base and a very light footprint there. At the same time, they have limited access to journalists and refused to disclose the number and tempo of the command’s operations, as well as the locations of its deployments and of bases that go by other names. AFRICOM’s public persona remains one of humanitarian missions and benign-sounding support for local partners. “Our core mission of assisting African states and regional organizations to strengthen their defense capabilities better enables Africans to address their security threats and reduces threats to US interests,” says the command. “We concentrate our efforts on contributing to the development of capable and professional militaries that respect human rights, adhere to the rule of law, and more effectively contribute to stability in Africa.” Efforts like sniper training for proxy forces and black ops missions hardly come up. Bases are mostly ignored. The word “war” is rarely mentioned. TomDispatch’s recent investigations have, however, revealed that the US military is indeed pivoting to Africa. It now averages far more than a mission a day on the continent, conducting operations with almost every African military force, in almost every African country, while building or building up camps, compounds, and “contingency security locations.” The US has taken an active role in wars from Libya to the Central African Republic, sent special ops forces into countries from Somalia to South Sudan, conducted airstrikes and abduction missions, even put boots on the ground in countries where it pledged it would not. “We have shifted from our original intent of being a more congenial combatant command to an actual war-fighting combatant command,” AFRICOM’s Rick Cook explained to the audience of big-money defense contractors. He was unequivocal: the US has been “at war” on the continent for the last two and half years. It remains to be seen when AFRICOM will pass this news on to the American public.